These omnivores enjoy fruits, such as mango's, melons, grapes, along with alfalfa, berries, grasses and dark green vegetables. In the wild it has been known to eat some carrion. South eastern Panama; East of the Andes in Columbia, Venezuela, Bolivia, Paraguay, Northern Argentina, Guyana, and Brazil. Red Foots prefer a more humid environment than most of the other tortoises. Glass Aquariums are not recommended unless you have tape or some material around the tank so the tortoise can see where it's glass limits are. I would purchase an ultrasonic humidifier for the aquarium with a timer. This will provide the indoor humidity this tortoise thrives for. Rubbermaid Containers and outdoor pens are recommended. If you live in a warm humid environment, a doghouse with an incandescent bulb works great for an outdoor habitat. Recommended size for a single Hatchling Red foot - 20 gallon to 50 gallon tank with UVB lighting. In captivity, you should use mango's, melons, grapes, along with alfalfa, berries, grasses and dark green vegetables, along with Tortoise food. DO NOT overfeed your red foots though. If you do, Shell pyramiding can become an issue. Yellow Footed Tortoises are common with Red foots. I wouldn't recommend any other tortoise. 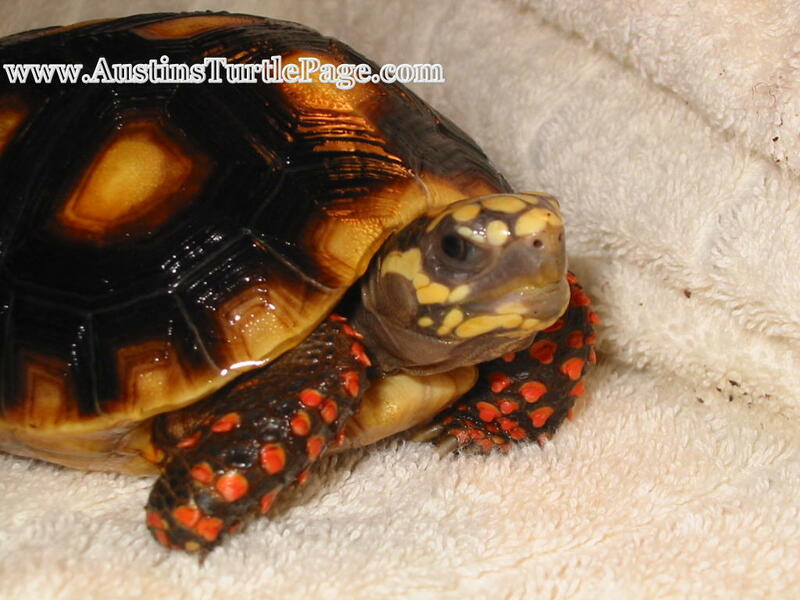 Red Footed Tortoises are Hardy, Active, And Friendly.